Saute onion and garlic until wilted and fragrant. Enter the beef, stir until it changes color. Add mushrooms, stirring until wilted. Enter the rice, stirring until blended. Lift. Move into the rice cooker pan, add broth and seasonings. Cook as usual until the rice cooked. Put rice in a container stock, sprinkle with nori pieces or fried onion. 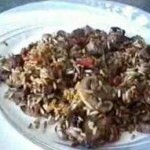 Serve Mushroom Beef Rice Recipe for 4 People.